Two glasses of Riesling in and I started thinking psh!— why the heck not? Hubby and I have been house hunting for some time now and we know nothing– nothing— about the real estate market. We both consider ourselves newbies to the Bay Area, California, and for the last few months, shot out offers here and there without knowing a thing about what we were doing. Being the diligent OCD types that we are, we’ve spoken to countless so-called real estate experts, agents, gurus, read all the projections, forecasts, and journals. And none of it is helping or assuaging any of our fears. “No,” he says back immediately. Too late. He planted the idea. I went a little more specific, though. I honed in on the Alameda County real estate market, since that’s where we’re looking to buy. I did not use a signifier card. The top three cards show the past, present, and projected future, left to right in chronological order; the second row tells us about convergences; and the final card is a message to those looking to buy real estate in Alameda County right now. Good news, it seems. The Empress card is all about fruition. Investments in real estate right now will still yield fruition, which does quell some of my fears about buying while prices are pretty high. The Empress here suggests that buying now is still okay. The future looks stable. Key 20, Judgement in reverse isn’t very good news, though, and it suggests that a whole bunch of people are wrong in their opinions on what’s going on in the market. We’re misinterpreting what we see, there’s a whole lot of materialism and ignorance going on, and purchases and sales are probably transacting with a lot of ill informed folks. Misreckoning is the theme here. That just means when we’re looking for that right house to call home, we need to be highly scrutinizing. It’s not just about which house we’d like to call home– there are actually quite a few bad apples on the market right now. Yikes! Don’t waive the inspection contingency, people! Whole lot of swords, by the way, affirming the mind games of the real estate market. Nine of Swords in the immediate past suggests recovery, entering a healing stage. Well that’s something most of us knew. Nice that the cards confirm that. The haunting pain of the past market crash is waning. Yay. There’s recuperation. The Knight of Swords that the card is converging into shows aggressive action. No kidding. Buyers are buying ambitiously. Sellers are selling ambitiously. It’s a warpath of real estate transactions in the East Bay right now, according to the Knight of Swords. King of Swords. More swords. A whole lot of force. It’s aggressive out there! King of Swords shows unyielding energy, continued ambitions. Ruthless action. Maybe even some malice and ulterior motives. Those buying later this year and even into the next in Alameda County: be careful. A lot of underhanded deals going on, self-serving folks in the game that do not have your best interest at heart (or registered at all) so if you don’t know what you’re doing and if you don’t stand your ground, you may get eaten alive. The market is kind of a war zone, it seems. A lot of swords clanging about. The Knight and King of Swords juxtaposed like that indicates a lot of collateral damage will happen and shady, shady deals. Be careful, people! My main worry about buying real estate right now, this year, is that the value of the property will go down in the coming years and when it comes time for me to sell, I won’t be able to sell at a profit. I’m worried that buying right now means buying too high. Rationally, I’m probably right. However, The Empress is a reassuring card to see. It’s of the Earth, no less. This is the card of fruition and material abundance. 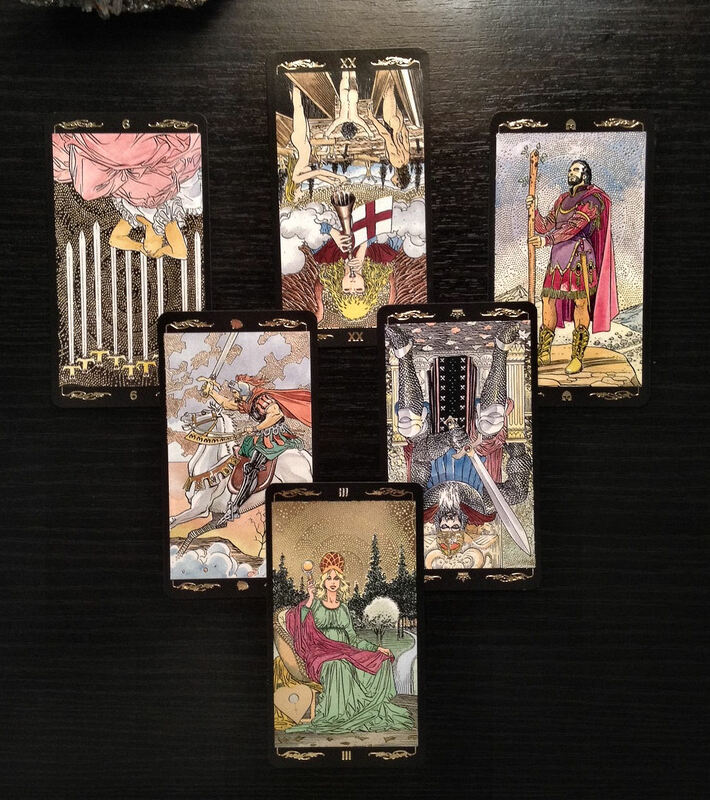 Thus, this little tarot reading seems to suggest that it’s good to buy in Alameda County right now. Buying now, generally speaking, will still yield fruition. From these cards, I don’t see that crash that I’m otherwise worrying about, the crash that I watched kill the financial health of so many people I knew back when I was in law school. So. That’s what my tarot deck says about the real estate market in Alameda. *shrug* Take what you will of it, if anything.